Step 1 Turn on the panini grill. While the grill heats, assemble the sandwich: Spread the cheese equally over two pieces of bread. Layer the ham equally over the cheese. Place the remaining slices of bread on top. Step 2 When the grill is hot (the light will turn on), place the sandwich (or both sandwiches, depending on the size of the bread and your panini grill) on the grill. Press the top of the grill down firmly, making sure that the top and the bottom of the grill are parallel. Step 3Cook, for about 4 to 5 minutes, until the cheese is melted and the sandwiches are golden. Lift the top and remove from the grill, cut into quarters, stack and top with chives. Serve immediately. In Recipes-list.com we have selected the most viewed recipes from category - Sandwiches . Enjoy the best recipes specially selected for you! 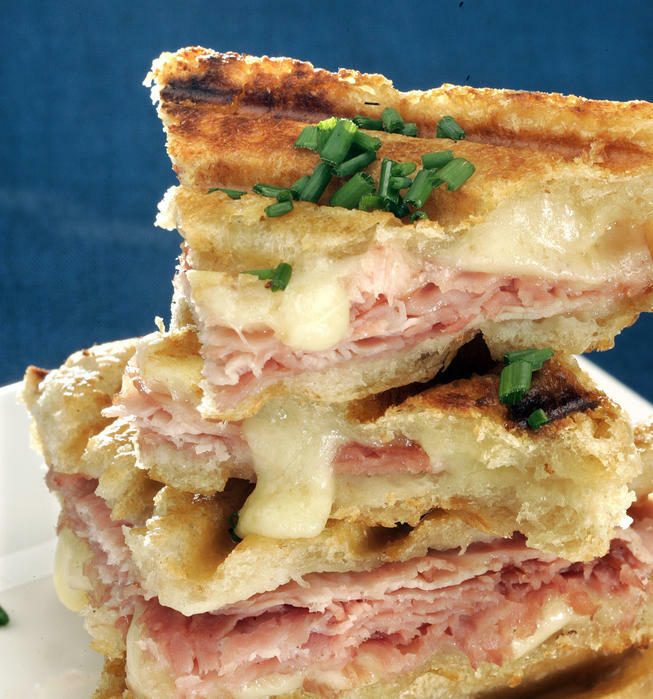 Croque monsieur is the right choice that will satisfy all your claims.